EmscherKunst wasn’t even a part of the Ruhr Triennale. It is a totally separate project being funded by the North Rhine Westphalia Kultur people who were sponsoring our trip. And it impressed the hell out of me. What it EmscherKunst is is thirty artworks placed along the banks of the Emscher river. It’s part of a wider, ecological project to completely reclaim this river. Basically, the Emscher (and I’m repeating an exhaustively detailed five hour walking tour’s worth of lecture here a month down the line, so forgive any errors) started off as a pretty standard river in the 18th century. During the industrialisation of the Ruhr – Germany’s coal and steel industries were based here until being shut down at the end of the eighties; fans of The Dambusters will remember it was the Ruhr valley that gets flooded at the end of the film – the river got repurposed and divided into a vast, straight canal and a second tributary which as far as I can make out flowed alongside as an open sewer. Our guide – roughly my age – told us that when he was growing up in the area that certain areas of the river were just no-go areas, stinking, unhygienic, the works. It sounds incredible that this could still be the case in the late eighties. The point of the wider ecological project is to de-toxify the river completely. New beds are being planned and all manner of clever scientific things, the details of which I didn’t follow one bit, are being done to return the river to a state of pre-industrial nature. At least as far as is possible while a massive autobahn runs down one side and numerous train tracks down the other. The point of the art in all this is to reconcile the communities living nearby with the once no-go areas. I do try not to use Germany as a stick with which to beat Britain, but can you imagine our government even beginning to bother? The selection of the art is also impressive. It’s predominantly by international rather than local artists (local artists did get a selection of those containers in which to make smaller projects). Artists of some standing, I’m given to understand. Granted some of the works are better (or more to my taste than others), but there’s a wide spread, and, more than this, they run the gamut from stern and forbidding to playful and interactive. I also happened to see something that is possibly my favourite piece of public art I’ve ever seen. I’ll whack in a few photos and try to explain a bit of context. For the record, there are thirty pieces commissioned by EmscherKunst, and it’s a project with funding that I think was €30 or €40 million. Which isn’t bad, right? We only saw a small fraction of them over a five hour afternoon, which also included some serious walking (and this was after Douglas Gordon and rAndom International in the morning. I don’t remember the last time I’ve been so worn out by art). These two pictures are just shots of information boards showing, well, obviously, an ariel view and a map of the area (click to enlarge, as with everything). The below four shots are all at the place from where we started our tour. This is the remnants of the original Emscher, now basically a pond, cut off from it's source. I think this bridge (below) also counted as an artwork, although it might just have been a particularly showily engineered bridge. Below are a selection of shots of the kunst by local artists, housed on a site near the above bridge. You probably know the kind of thing. Bit conceptual, bit texty. Nothing especially grabbed me, although I did like the flowers and the typefaces. It's a pretty flat, spacious landscape. The overcast day with the clouds gave the whole thing an added sense of depth. And, not that you can see it well in this photo, that gas storage tower on the left bank in the distance was wrapped *on the inside* by Christo (you know the guy, right?) recently, but had now closed. (The Sorcerer's Apprentice, after the Goethe tale) and is made by the Berlin group Inges Idee. I kind of loved how well it worked with its title -- you can completely see where they're coming from. And making it out of a pylon -- there seemed to be nothing but pylons down the sides of this river. Oh, I dunno. It just struck me as a fun intervention in the landscape. The uncanny alongside the playful. Making you look twice at the familiar. All that stuff art's meant to do, right? Indeed, it might be *the* most Northern European thing I've ever seen in my life. Kind of a distilled essence of Borgen and Ikea. And apparently it wasn't cheap either (rooms were available for €90 per night). And if we're going to get distracted by ideas of identifiable national identities in art, then I have to admit that hearing, Apolonija Šušteršič, the creator of the half-finished (it really is just half finished, that's not the art- bit) Play_Land was Slovenian. There seemed to be something fitting about the use of large sections of sewer-piping to create a children's play area to replace one being destroyed by the rebuilding of a sewer that seems to fit with the nationa philosophy/sense-of-humour that also gave the world Slavoj Žižek and Neue Slowenische Kunst. It was this incredible little model village-on-stilts built on a small artificial pond, which was just stood in this field, about five-hundred yards from the real river. The houses were all painted grey, and it had a very obviously non-naturalistic backdrop. They were kind of like little medieval, European houses, but also a bit like actual stuff you find in Vietnam or Bangladesh. Part of the reason I loved it so much was because one of the earliest things I wanted to do when I was little was make models like that (I guess for special effects on TV or film -- this was before CGI when people did still actually make things and this was a real job that actual people had), so I guess I am always destined to be quite moved by really intricate model-making, but, hell, I think it's moving anyway. But then there was also the fact of its delicacy just standing there in the middle of a pond, in the middle of a field, in more or less the middle of nowhere. And the fact it is in the middle of an incredibly economically depressed area and hadn't even been vandalised. Then there was the way that it looked like a theatre set. And the interesting fact that because it was miniature (although pretty big, but maybe quarter of "real" size), and painted a uniform grey, it was totally non-naturalistic, but also still using "realism" at the same time as "fantasy" and "make-believe" -- which somehow made it all the more effective, and potent, and made you want to imagine things about it. And consider it as a metaphor. And everything. And as I was standing looking at it, my iPhone died, so I don't have a single photograph of it. Which I think I might even be quite pleased about. 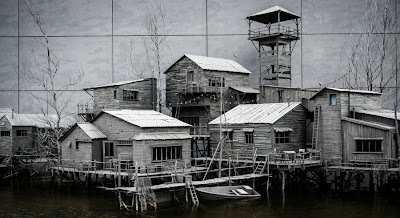 It's called The Settlement and it's by an artist called Hans op de Beeck, so you can Google image search it if you want, but I've just looked, and, as I suspected, there's nothing that a photo can really do to convey what it was like standing there at six in the evening, at dusk, in front of this incredibly touching, poignant little thing.